Please note errata link above IF you purchased prior to 7/15/13. 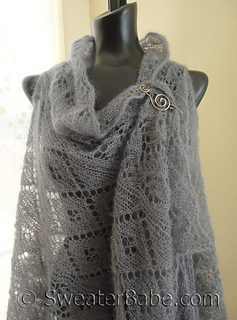 ALL Ravelry purchases prior to that date were sent the errata update that same day. 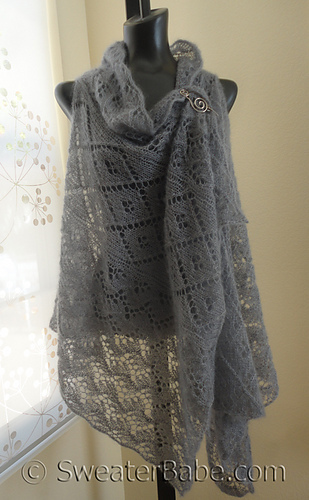 Here’s a chic alternative to your regular rectangular shawl – one with armholes knit in so you can wear it as a vest and allow the gorgeous length of lace to cascade down the front. 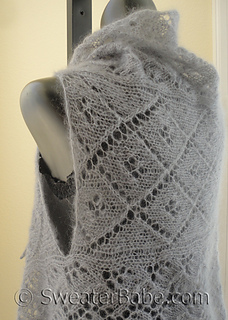 Style it with a shawl pin (as shown at right) or leave it open. 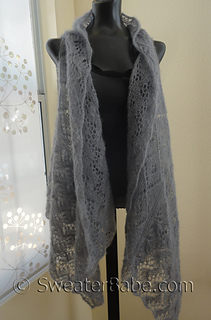 A heavenly kid mohair/silk blend yarn in this lovely light grey shade makes this a “goes-with-everything” item that is nothing short of stunning. 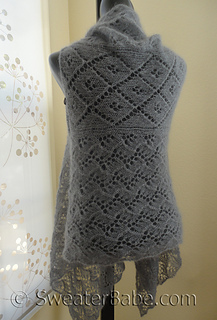 A little bit of fabric up top serves as a soft layer gathering against your neck. 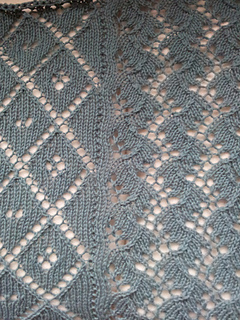 Two different lace designs keep the project interesting. 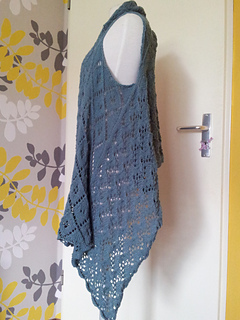 Deep armholes allow you to layer this over tanks or long sleeves to maximize its versatility. Who says chasing the chill away can’t be easily disguised as you dressing with elegance and style?